The Philippine archipelago lies in Southeast Asia in a position that has led to its becoming a cultural crossroads - a place where Malays, Hindus, Arabs, Chinese, Spaniards, Americans, and others had interacted to forge a unique cultural and racial blend. The archipelago numbers some 7,641 islands. The Philippines occupies an area that stretches for 1,850 kilometers (1,150 mi) from about the fifth to the twentieth parallels north latitude. The total land area is 300,000 square kilometers (115,831 sq mi). Only approximately 1,000 of its islands are populated, and fewer than one-half of these are larger than 2.5 square kilometers (1 sq mi). Eleven islands make up 95 percent of the Philippine landmass, and two of these — Luzon and Mindanao — measure 105,000 square kilometers (40,541 sq mi) and 95,000 square kilometers (36,680 sq mi), respectively. They, together with the cluster of islands in Visayas in between them, represent the three principal regions of the archipelago that are identified by the three stars on the Philippine flag. The Philippines is broken up in many islands by the sea. This gives it the fifth longest coastline of 36,289 kilometers (22,549 mi) in the world. The Exclusive economic zone of the Philippines covers 2,263,816 km2 (874,064 sq mi), 200 nautical miles (370 km) from its shores. Off the coast of eastern Mindanao is the Philippine Trench, which descends to a depth of 10,430 meters (34,220 ft). The Philippines is part of a western Pacific arc system characterized by active volcanoes. Among the most notable peaks are Mount Mayon near Legazpi City, Taal Volcano south of Manila, and Mount Apo in Mindanao. All of the Philippine islands are prone to earthquakes. The northern Luzon highlands, or Cordillera Central, rise to between 2,500 meters (8,200 ft) and 2,750 meters (9,020 ft), and, together with the Sierra Madre in the northeastern portion of Luzon and the mountains of Mindanao, boast rain forests that provide refuge for numerous upland tribal groups. The rain forests also offer prime habitat for more than 500 species of birds, including the Philippine eagle (or monkey-eating eagle), some 1,100 species of orchids, and some 8,500 species of flowering plants. To protect the country's biological resources, the government has taken a first step of preparing a Biodiversity Action Plan to address conservation of threatened species. Most of the islands used to be covered by tropical rainforests. However, illegal logging has reduced forest cover to less than 10% of the total land area. The islands are volcanic in origin, being part of the Pacific Ring of Fire, and are mostly mountainous. The highest point in the country is the peak of Mount Apo in Mindanao, which is 2,954 meters (9,692 ft) above sea level. The second highest point can be found on Luzon at Mount Pulag, a peak 2,842 meters (9,324 ft) above sea level. The Philippine Archipelago is geologically part of the Philippine Mobile Belt located between the Philippine Sea Plate, the South China Sea Basin of the Eurasian Plate, and the Sunda Plate. The Philippine Trench (also called the Mindanao Trench) is a submarine trench 1,320 kilometers (820 mi) in length found directly east of the Philippine Mobile Belt and is the result of a collision of tectonic plates. The Philippine Sea Plate is subducting under the Philippine Mobile Belt at the rate of about 16 centimeters (6.3 in) per year. Its deepest point, the Galathea Depth, has a depth of 10,540 meters (34,580 ft). The Philippine Fault System consists of a series of seismic faults that produce several earthquakes per year, most of which are not felt. Many volcanoes in the country are active, the most recent eruption being that of Mount Pinatubo on Luzon in 1991. Mount Mayon is another of the active volcanoes and has the world's most perfectly shaped cone. Mayon has a violent history of 47 eruptions since 1616 and another violent eruption is currently feared. Taal Volcano, also located on Luzon, is one of the Decade Volcanoes. Mayon Volcano overlooking the city of Legazpi. The Batanes and Babuyan Islands are situated on the northernmost extremity of the Philippines at Luzon Strait facing Taiwan. It contains the northernmost point of land, the islet of Y'Ami in the Batanes Islands, separated from Taiwan by the Bashi Channel (c.80.4672 kilometers (50.0000 mi) wide). This region stretches from Mairaira Point in Pagudpud, Ilocos Norte in the north to Cochinos Point in Mariveles, Bataan in the south. The terrain ranges from coastal plains to rugged mountains bordered by the South China Sea in the west and the Cordillera Central and Zambales mountain ranges in the east. Western Luzon is known for its beaches, surf spots and historic towns. Nestled between the Cordilleras in the east and the Sierra Madre mountain ranges in the west is the Cagayan Valley, also the name of the administrative region which it covers. Through its center runs the country's longest river, the Cagayan, flowing in a northward direction before emptying its waters in the Luzon Strait at the town of Aparri. The Cordilleras and Caraballos, together with the Sierra Madre Range, form the main mountain system in Northern Luzon. The Cordilleras consists of two, sometimes three, mountain ranges that are found in northwestern central Luzon. The first, called Caraballo del Sur, forms the nucleus of the system and has its highest peaks in the border between the provinces of Abra, Ilocos Norte and Cagayan. Caraballo Occidentalles, is further divided into two ranges, the Cordillera Norte and Cordillera Central. They line the central portions of the Cordillera Administrative Region. The Caraballos (Caraballo de Baler) start where the Sierra Madre and the Cordilleras meet. They are found south of Cagayan Valley, northeast of the Central Luzon Plains. Lying in the eastern portion of Luzon is the longest mountain range in the Philippines, the Sierra Madre, stretching from Quezon province in the south to Cagayan in the north. 80 percent of the mountain range is tropical rainforest, which is diminishing from rampant illegal logging activity. The range serves as the eastern wall of Luzon Island that protects inhabitants from tropical cyclones usually coming from the Pacific Ocean. The largest plain of the nation is situated in the Central Luzon region and produces most of the national rice supply, earning itself the nickname "Rice Bowl of the Philippines". The plains encompass the provinces of Bulacan, Nueva Ecija, Pampanga, Tarlac and Pangasinan. South of the Central Luzon plains lies the largest inland freshwater lake in Southeast Asia, the Laguna de Bay. To the east of the lake is a plain that stretches westward to the Manila Bay. Large rivers from bays and mountain springs traverse the plain. In the northern part of the region, that is, Manila and Rizal, most of the plain had been converted into cities and towns, and are thus industrialized. Lying east of the lake is the southern terminus of the Sierra Madre mountain range at northern Quezon province. To the southwest of the Laguna de Bay is the nation's third largest lake, the Taal, bordered to the north by the Tagaytay Ridge, a ridge stretching from southern Cavite to northern Batangas provinces. The Bondoc Peninsula is located in the southeastern part of Quezon Province. Southeast of Laguna de Bay lies the Bicol Peninsula, connected to mainland Luzon by the isthmus of Tayabas. The predominantly flat landscape features several solitary peaks, usually active volcanoes, which include Iriga, Mayon and Bulusan. The peninsula has an irregular coastline that features large bays and gulfs, which include the Lamon Bay, San Miguel Bay, Lagonoy Gulf, and Albay Gulf to the north, and the Tayabas Bay, Ragay Gulf and Sorsogon Bay to the south. Mindoro's coastal plains are characterized by rice and corn fields, rivers, beaches, and extensive open space areas. Most of the population is concentrated on the northern and eastern coast of this island where the city of Calapan and Puerto Galera are located. The Mindoro mountain range begins with Mount Halcon and is further divided into three. The northwest ends at Calavite Point and is a landmark for ships. The east originates from Lake Naujan and the west follows the Mindoro Strait. The Kalayaan Islands are located to the west of Palawan. Kalayaan is a Filipino word meaning "freedom". Visayan group of islands: Western Visayas (red), Negros Island (green), Central Visayas (light blue), and Eastern Visayas (pink). An old map of Mindanao from the Atlas of the Philippine Islands (1900). 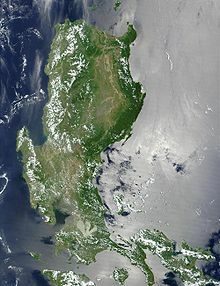 The eastern coast of Mindanao features a long mountain range, the Eastern Pacific Cordillera, which stretches from Bilar Point at Surigao in the north to Cape San Agustin at Davao in the south. Forming its northern portion are the Diwata Mountains (also spelled Diuata), separated from the south by low passes situated at the middle. To the east of the range are narrow strips of lowland that feature several inlets and bays, the most prominent of which include the Lianga and Bislig bays. To the west of the Pacific Cordillera lies an extensive lowland, the Davao-Agusan Trough. Its northern portion includes the Agusan Valley which forms the lower river basin of the Agusan River. The river flows in a northward direction and empties into the Iligan Bay. Draining the southern portion of the lowland are several other rivers, which include the Tagum, flowing southward to the Davao Gulf. Situated west of the Davao-Agusan Trough is a complex series of mountain ranges called the Central Mindanao Highlands (also known as the Central Cordillera). From these mountains form the headwaters of several rivers which include the Rio Grande de Mindanao, Pulangi, Maridagao and Tagoloan rivers. Several tall mountains, such as Mount Apo, the country's highest are found within the range. The north-central portion of Mindanao is dominated by an extensive highland region, the Bukidnon-Lanao Plateau, which includes the Kitanglad and Kalatungan mountain ranges. Within the plateau lies the country's second largest lake, Lake Lanao situated at an elevation of 2,296 feet, drained by the Agus River flowing northward to its river mouth at Iligan Bay. South of the Bukidnon-Lanao Plateau lies a large depression, the Cotabato Basin, which forms the lower river basin of the country's second largest river system, the Rio Grande de Cagayan (also known as the Mindanao River). Surrounded by three mountain ranges, the basin's only opening to the sea is to the northwest at Illana Bay, where the Mindanao River empties into the ocean. To the southeast of the main basin are two large valleys, the Koronadal and Allah valleys. Situated south and west of the Cotabato Basin are a moderately high mountain range, the Tiruray Highlands, which block off the Basin from the southern coastline. South of the highlands are narrow strips of coastlines. At the northwestern tip of Mindanao is the generally mountainous Zamboanga Peninsula. The chain of mountain ranges in this region is called Zamboanga Cordilleras, with the highest elevation at Mount Dapi, which is 2,617 meters (8,586 ft) high. The southern coastline is irregular, featuring two smaller peninsulas, the Sibuguey and Baganian, extending southward to the Moro Gulf. To the north of the Diwata Mountains at northeast Mindanao lie Siargao island and the Dinagat group of islands. Southwest of the Zamboanga Peninsula is the Sulu Archipelago, a chain of islands which comprise the smaller archipelago provinces of Basilan, Sulu, and Tawi-Tawi. The Philippines is divided into a hierarchy of local government units (LGUs) with the 81 provinces and 38 independent cities as the primary unit. Provinces are further subdivided into component cities and municipalities, both of which consist of barangays, the smallest local government unit. There are 17 regions comprising the Philippines. Each region, with the exception of the National Capital Region, is further subdivided into component provinces. The National Capital Region is divided into four special districts. Most government offices establish regional offices in a city to serve the constituent provinces. Such cities are designated as "regional centers". The regions themselves do not possess a separate local government, with the exception of the Bangsamoro Autonomous Region. Forming the regions, with the exception of the National Capital, are the 81 provinces. Each province has a capital city or municipality. Of the 81 provinces of the Philippines, 15 are landlocked, and 16 are island provinces. A These provinces have coastlines on Laguna de Bay, a large lake. Since lakes do not allow access to seaborne trade, they are considered to be landlocked. The Philippines has a tropical climate dominated by a rainy season and a dry season, although certain locations have no dry season (meaning, all months have an average rainfall of above 60 mm) and certain higher-altitude areas can have a subtropical climate. The summer monsoon brings heavy rains to most of the archipelago from May to October, whereas the winter monsoon brings relatively cooler and drier air from December to February. Manila and most of the lowland areas are hot and dusty from March to May. Even at this time, however, temperatures rarely rise above 37 °C (98.6 °F). Mean annual sea-level temperatures rarely fall below 27 °C (80.6 °F). Annual rainfall measures as much as 5,000 millimeters (196.9 in) in the mountainous east coast section of the country, but less than 1,000 millimeters (39.4 in) in some of the sheltered valleys. Monsoon rains, although hard and drenching, are not normally associated with high winds and waves. But the Philippines sit astride the typhoon belt, and it suffers an annual onslaught of dangerous storms from July through October. These are especially hazardous for northern and eastern Luzon and the Bicol and Eastern Visayas regions, but Manila gets devastated periodically as well. In the last decade, the Philippines has been hit severely by natural disasters. In 2005 alone, Central Luzon was hit by both a drought, which sharply curtailed hydroelectric power, and by a typhoon that flooded practically all of low-lying Manila's streets. Still more damaging was the 1990 earthquake that devastated a wide area in Luzon, including Baguio and other northern areas. The city of Cebu and nearby areas were struck by a typhoon that killed more than a hundred people, sank vessels, destroyed part of the sugar crop, and cut off water and electricity for several days. The Philippines is prone to about six to nine storms which make landfall each year, on average. The 1991 Mount Pinatubo eruption also damaged much of Central Luzon, the lahar burying towns and farmland, and the ashes affecting global temperatures. Unless otherwise indicated, the information below is taken from CIA Factbook information for the Philippines. Territorial sea: irregular polygon extending up to 100 nautical miles (190 km; 120 mi) from coastline as defined by 1898 treaty; since late 1970s has also claimed polygonal-shaped area in South China Sea up to 285 nautical miles (528 km; 328 mi) in breadth. Timber, petroleum, nickel, cobalt, silver, gold, salt, and copper. The Philippines sit astride typhoon belt and are usually affected by 15 and struck by five to six cyclonic storms per year; landslides; active volcanoes; destructive earthquakes; tsunamis. Uncontrolled deforestation in watershed areas; soil erosion; air and water pollution in Manila; increasing pollution of coastal mangrove swamps which are important fish breeding grounds; severe water pollution that caused the death of one of the country's major rivers, though there are ongoing efforts at resuscitation. Typhoon Haiyan in November 2013 caused major problems. In political geography, an enclave is a territory or part of a territory lying wholly within the boundaries of another, and an exclave is one which is politically attached to a larger piece but not actually contiguous with it. Many entities are both enclaves and exclaves, but the two are not synonymous. Caloocan City is divided in two by Valenzuela City and Quezon City. In Cotabato province, the municipality of President Roxas is divided in two by Antipas municipality. Sarangani province is separated into two sections by General Santos City and Sarangani Bay. Isabela City, the provincial capital of Basilan province (part of the Bangsamoro Autonomous Region) is part of Zamboanga Peninsula despite it being separated from it by the Basilan Strait. Zamboanga City, a highly urbanized independent city, is statistically part of Zamboanga del Sur province, but is separated from it by Zamboanga Sibugay province. A quadripoint is a point on the Earth that touches four distinct regions. Such points are often called "four corners", from the corners of the four regions meeting there. Four distinct geographic divisions converging at a single point is not uncommon in the Philippines, and there are other points of convergence between five or more divisions that can be found. The island province of Marinduque prides itself as being the geographic center of the Philippines. The Marinduque governor has stated that their claim to be the Geographical Center of the Philippines has received notice and support from the National Mapping and Resource Information Authority (NAMRIA). The Luzon Datum of 1911 in Marinduque is used as point number one for all map makers in the country. The boundaries of the Philippine archipelago are described in Article III of the Treaty of Paris (1898), as comprising an irregular polygon. A box enclosing that polygon would have corners at 20°N 116°E, 20°N 127°E, 4.75°N 127°E, 4.75°N 116°E. The center of this box would lie at 121.5 E, 12.375 N. That point lies roughly in the center of the Tablas Strait between the islands of Tablas and Mindoro. Republic Act No. 9522, "An Act to Define the Baselines of the Territorial Sea of the Philippines", describes an irregular polygon which fits within a box with its center at 121°44'47.45"E 12°46'6.1252"N, a point also roughly in the center of the Tablas Strait. The CIA Factbook locates the Philippines at 13°N 122°E. Amianan Island, Batanes 21º7’18.41" 121º56’48.79"
Pusan Point, Davao Oriental[a] 7º17’19.80" 126º36’18.26"
Frances Reef, Tawi-Tawi 4º24’53.84" 119º14’50.71"
Thitu Island[b], Kalayaan, Palawan 11°3’10.19" 114°16’54.66"
a Pusan Point is the easternmost incorporated territory of the Philippines, but the Benham Plateau is the easternmost unincorporated territory of the Philippines. b Thitu island is the westernmost of all the Spratly Island features controlled by the Philippines as of December 2009[update]. The center of a box enclosing these points would be located at 12°46’6.13"N, 120°26’36.46"E. That point is located in the Mindoro Strait, about 12 kilometres (7.5 mi) NNE of Apo Island, in Sablayan, Occidental Mindoro. The following is a list of the most populous cities in the country, with their population according to the 2010 census. Component cities and municipalities of Metro Manila, Metro Cebu and Metro Davao are taken as one to show the extent of urbanization. ^ a b c "World Development Indicators - DataBank". databank.worldbank.org. ^ "Philippines Mountain Ultra-Prominence". peaklist.org. Retrieved 2009-06-19. ^ (2011-04-06). "The World Factbook – Philippines". Central Intelligence Agency. Retrieved on 2011-03-14. ^ "More islands, more fun in PH". CNN Philippines. February 20, 2016. ^ a b "Namria discovers 400 to 500 new islands in PHL archipelago". 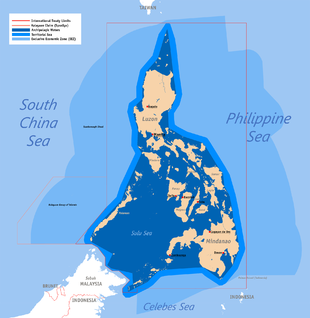 ^ The count of islands was pegged at 7,107 in 1945, and was updated to 7,641 in 2017 after the Philippine National Mapping and Resource Information Authority (NAMRIA) announced that it had identified 400 to 500 additional land features that might be considered islands. ^ "The Philippines". Republic of the Philippines, National Government Portal. Retrieved 16 December 2017. ^ a b c d e f g h i j Wernstedt, Frederick L.; Spencer, Joseph Earl (1978). The Philippine Island World: A Physical, Cultural, and Regional Geography. Berkeley: University of California Press. pp. 32–37. ISBN 9780520035133. Retrieved 27 January 2016. ^ a b c d Hinz, Erhard (1985). Human Helminthiases in the Philippines the Epidemiological and Geomedical Situation. Berlin, Heidelberg: Springer Berlin Heidelberg. pp. 129–131. ISBN 9783642708411. Retrieved 27 January 2016. ^ a b Philippines : Geography Archived January 11, 2010, at the Wayback Machine, CIA World Factbook. ^ Cezar Tigno, Resuscitating the Pasig River Archived 2010-07-07 at the Wayback Machine, Asian Development Bank, April 2009. ^ STATE OF THE PROVINCE ADDRESS of Gov.JOSE ANTONIO N. CARRION, GOVERNOR OF MARINDUQUE Archived 2009-12-06 at the Wayback Machine, July 7, 2008. ^ Treaty of Peace Between the United States and Spain, The Avalon project. ^ Republic Act No. 9522,An Act to Define the Baselines of the Territorial Sea of the Philippines, as amended by Section 1 of Republic Act No. 5446, The LawPhil project.